15 minutes to get ready, gather everyone, pack the instruments, decide what to do/sing/say. Challenge accepted, we told ourselves. It’s kids after all, of course we had to go. Good morning! The past few days, I felt very fortunate to get to know some amazingly strong and inspiring people in Jordan; not only at the refugee camps but also at the NGOs we visited so far. But there was still something I kept asking myself: when do I get to meet the kids? (Other team members had but the workshops I had attended so far were for staff-members or adults at refugee camps). Yes, all seven of us who were supposed to stay at home and prepare for the concert the following day, made it to the nursery and set everything up as fast as we could. Instruments – check. Song texts – check. M2R roll up – check. Music for the dance – check. 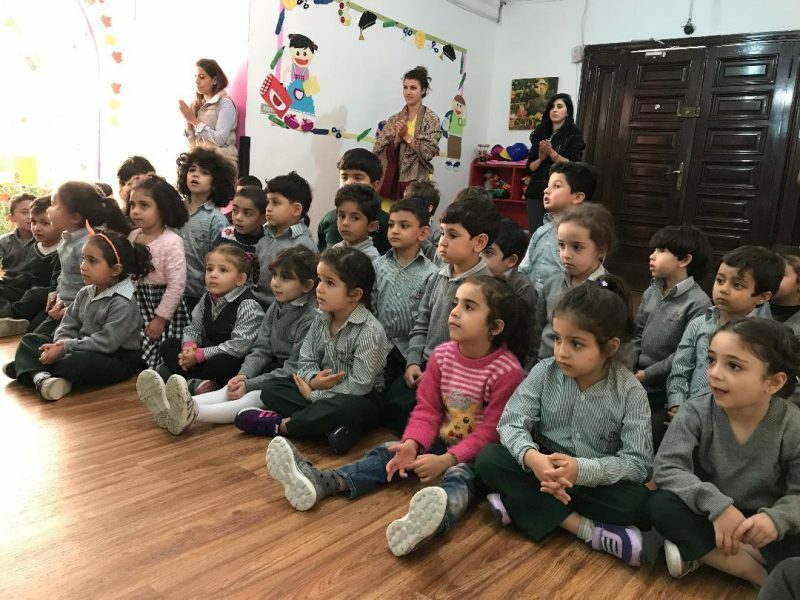 Alright, let’s get started, we thought, full of excitement and curiosity to see how children that young (2-4 years) would react to our songs, dance and the idea of closing their eyes and being quiet for 5-10 minutes during meditation. Soon after they started arriving, we were all filled with endless joy. Instead of us having to wait for them to calm down so we could start, we were the ones who had to really gather ourselves and focus to get started. They were incredibly well-behaved and adorable. It was very heartwarming for us to see them meditate, keep their eyes shut and remain silent at that age. When they were asked to open their eyes they all screamed “thank you” and danced with us during our last song. We felt like they were able to feel our energy but we also truly felt blessed to start our day with these innocent and sweet children. Despite the short notice and lack of plan, it was one of our most successful and joyful sessions. Spontaneity indeed is beautiful. 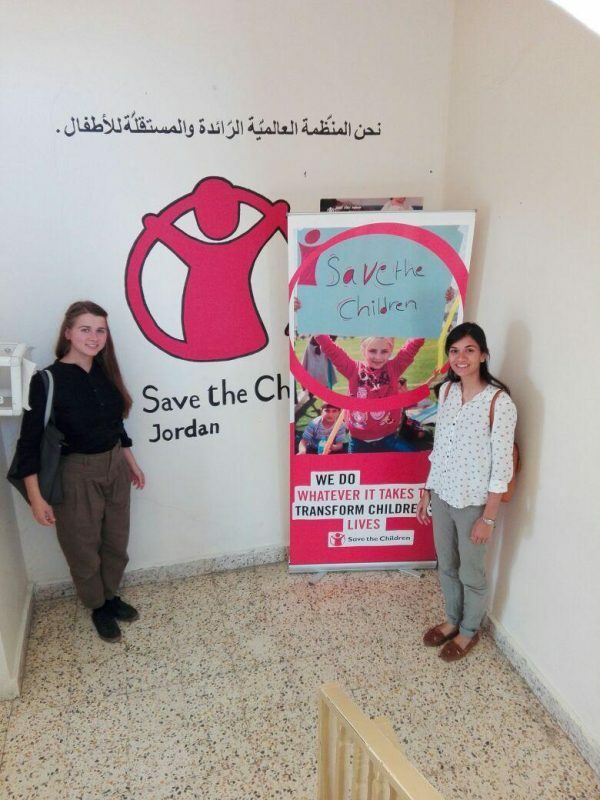 In the meantime six members of our group held a workshop with 35 staff members at the Save The Children Jordan office in the morning. We have had a connection with them for many years and M2R was there for the 4th time today. Being able to host a workshop for the fourth time with them feels very special as it reflects their trust in us. Later in the afternoon, after an intense dance practise (a dance we will hopefully be performing tomorrow), eight of us headed to the Telbiah Refugee Camp (also for the fourth time) to lead two parallel workshops (men/women) with their staff and refugees. Feeling prepared for this session we reached the camp. As soon as we arrived, the boys headed to lead the men-workshop and four of to the women-workshop. 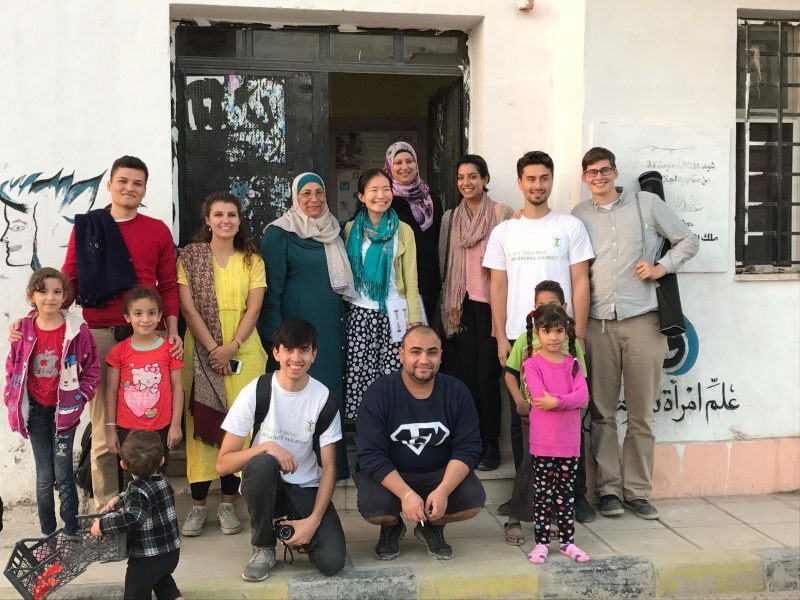 Usually (or let’s say every time until now), when we reach a camp, we find a couple of people who speak English or have someone in our group who speaks Arabic. Today however, we found out that none of the staff-members at the camp spoke English. Putting on our spontaneity hat again, we had to improvise, change some parts of the workshop and find a way of communicating with them regardless of the language barriers. It was time to unpack all our Arabic reading material, open Google Translator and try our best to make most of our body language. We somehow made it thorough the workshop and once they opened their eyes after the meditation, we all felt an instant connection. They were not able to express their feelings in words but their eyes reflected their state of silence and peace. One of the ladies explained (using her hands and a big smile on her face) that she felt like she was absolutely free from all burden. That alone made all the effort worth it. After the workshop our team gathered again and we were then invited to have lunch with Jo Ker and Hussain, who teach Music and Film Studies to the kids. They shed a different light on the camp to us and shared some interesting insights. They explained how the Telbiah camp, located very close to the airport, gives a sense of security to the refugees, since the airport is a highly secure place and therefore there is a low risk of any incidents happening in that area. Jo Ker also explained how they offer Identity Classes since the topic of identity is of great importance to refugees and many live with an on-going conflict of understanding it. Music and Film Studies should also open doors for them to enter industries that are untypical in their environment. Overall they both had a different and inspiring approach to dealing with refugees. We wish them all the best and hope they keep up their great work in creating a creative space for the new generation of refugees. It was a day filled with some eye-opening, intense and beautiful moments. We ended this day by heading down-town where we all stood in front of the mesmerising Grand Husseini Mosque, reflecting on our time so far. We did also finally get to taste the famous Jordanian sweet-dish “Kafla”. I loved it!